Molly Corbett Broad, president of the American Council on Education (ACE) and former president of the University of North Carolina, has been appointed to the Committee on Coherence at Scale for Higher Education. Broad is the first woman to lead ACE since its founding in 1918. 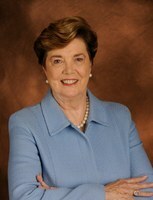 She came to ACE from the University of North Carolina (UNC), where she served as president from 1997-2006. Prior to her tenure at UNC, she held a number of administrative and executive positions at the California State University System, Arizona’s three-campus university system, and Syracuse University. Broad joins three other new members appointed to the committee since its inaugural meeting in March 2013. They are Dan Cohen, executive director of the Digital Public Library of America; Scott Waugh, executive vice chancellor and provost of the University of California, Los Angeles; and Jere Morehead, president of the University of Georgia. Blog Post by Charles Henry, "A Pivotal Year for the Committee on Coherence at Scale"
Copyright © 2013 Committee on Coherence at Scale for Higher Education. All rights reserved.